Some terms used in other countries or in the past in the US include acoustic signals, audio-tactile signals, audible pedestrian signals, audible traffic signals, audible pedestrian traffic signals and audible crossing indications. Accessible pedestrian signals is more accurate to describe devices we’ll be talking about today. 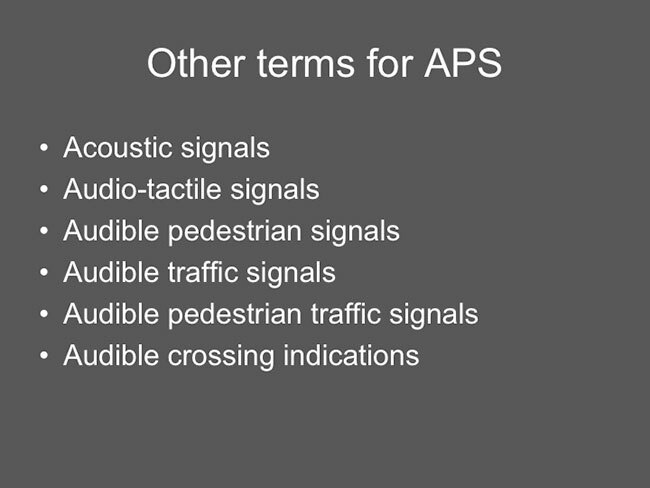 We will use the term APS, as singular and plural, for accessible pedestrian signals in this course.